Put your best foot forward! It’s time to play Step On Up Slots by Mr Spin Casino, and see if you can spin in a real diamond of a win. This classic slots game is bright, colourful, and – most importantly – packed full of sparkling wins. 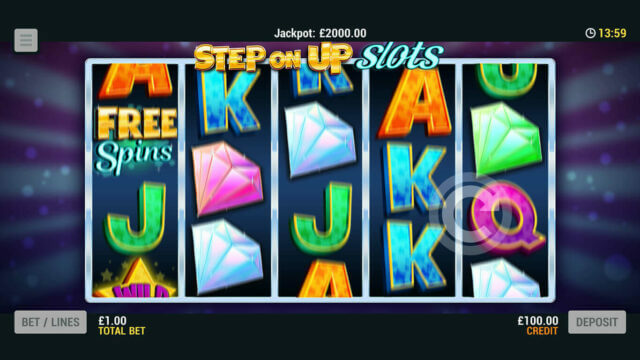 Set across 9 win lines, Step On Up Slots certainly isn’t missing any of Mr Spin’s mobile slots charm. Charm like the huge progressive Mega Jackpot that could certainly put a smile on your face. Take this Bobby Dazzler for a spin today, and see if you spin in a 24-carat win. Step On Up Slots is compatible with devices running Android 5 and iOS 10 and above only. To get started with Step On Up Slots, select “Play for Real” from the game menu. If you want to practice for free, you can try it out in “Demo Mode” – either way, whatever you do next is the same so keep reading! Firstly, you need to decide how many win lines you want to play across and how much you want to bet per line. There are 9 win lines to choose from, and you can bet anything from 2p up to £20 a line. Tap ‘Bet/Lines’ to open the menu, and adjust these parameters using the ‘+’ and ‘-’ arrows. Shining bright like a diamond at the top of this menu, is your ‘Total Bet’ amount. This is calculated by multiplying your bet-per-line and number of active win lines together, and is how much you’ll spend per spin. For example, a 50p bet across all 9 win lines will give you a total bet of £4.50. When you’re happy, tap the white arrow and the Step On Up Slots reels will start spinning into action. There’s also a ‘Max Bet’ feature in Step On Up Slots. This uses your current credit amount to make the highest value spin possible. You’ll have to confirm you’re happy with this before the bet is placed, and this pop-up re-sets with every new play. Need to keep your hands free to show off your bling? No problem! Tap ‘Bet/Lines’ to access the Auto Spin feature. Here, you set the number of spins you want the game to play through automatically and a credit limit. Tap the arrow when you’re happy, and the reels will spin though that number of spins automatically. Auto Spins will end when you run out of spins, or when you tap ‘Stop’. Ready to step up to the plate and play Step On Up Slots? Once you’ve got your slots settings in order, it’s time to tap the white arrow and begin playing! The reels will then begin to spin before coming to a stop at random. Spin in a winning combination of symbols on an active win line, and it will light up on the reels. Your prize amount will be displayed on screen, before winnings are added to your credit. And, because Mr Spin likes to make things crystal clear, active win lines always pay from left to right. There are plenty of ways to spin in a win when you’re playing Step On Up Slots! You’ll grab a multiplier of your original bet-per-line when you spin in a winning combination of symbols. For some, you’ll need 2 or more whereas for others you’ll need a minimum of 3. That’s not all, because our diamond symbols are anything but rough! Spin in three or more of any coloured diamond and you’ll bag yourself a special mixed win multiplier! Here’s the real jewel in the crown: spin in winning combinations on multiple win lines, and they’ll be added together to give you an extra sparkly total win! In the interest of clarity, we need to tell you that only the highest win-per-line will be paid if you spin in more than one win on a single win line. Seeing stars isn’t a bad thing when you’re playing Step On Up Slots mobile slots, because those yellow star symbols are your wilds and could prove very handy. In fact, forget diamonds ‘cause these guys could be your new best friend. Wilds can help you turn a losing spin into a winning one, because they substitute for all other symbols except the Free Spins symbol. For example, spin in two pink diamonds alongside a Wild, and you’ll be awarded the multiplier for three pink diamonds. It’s not possible to win the progressive Mega Jackpot with a Wild alongside your Jackpot symbols. You need five of the red 7 Jackpot symbols to win the top prize! If you’re feeling lucky and want to try and maximise your wins, you could choose to gamble it with this Step On Up Slots bonus feature! When you spin in a win, the Gamble Feature wheel will pop up on the middle of the screen. Just tap this to risk your stake for a bigger win. In the Gamble Feature, you’ll have a choice of multipliers. Select one, and press the white arrow to spin the wheel. If it stops on a green section, you’ll receive a bigger prize. If it stops on red though, you lose your original win and go back to the main reels. The bigger the multiplier, the more red sections on the wheel. What will you choose to do? You can return to the main reels with your original prize at any point before you press the spin arrow simply by tapping ‘Collect’. Wins over £1,000 and the Mega Jackpot cannot be gambled. Spin in 3, 4, or 5 Free Spins symbols in any order on the reels, you’ll bag yourself 5, 10, or 15 respective free spins. You won’t be able to miss this symbol either, as it’s yellow and blue and says “Free Spins” on it! These free spins will be locked to the bet parameters of your last paid for spin, but because Mr Spin is footing the bill, these ones are on us and your credit won’t take a hit. Step On Up Slots has a theoretical return to player of 94.6%. This is based on long term playback. System malfunctions void all payments. Monies are staked in the following order: winnings, player deposits, bonus credit.